Auto-Tune, and pitch correction in general, has become so ubiquitous in the studio (and more recently, the stage too), that it is easy to forget that the technology is constantly evolving and improving. We last reviewed Antares Auto Tune several years back at Version 7, and while it was better than the versions that came before it, Antares did not sit on their laurels. 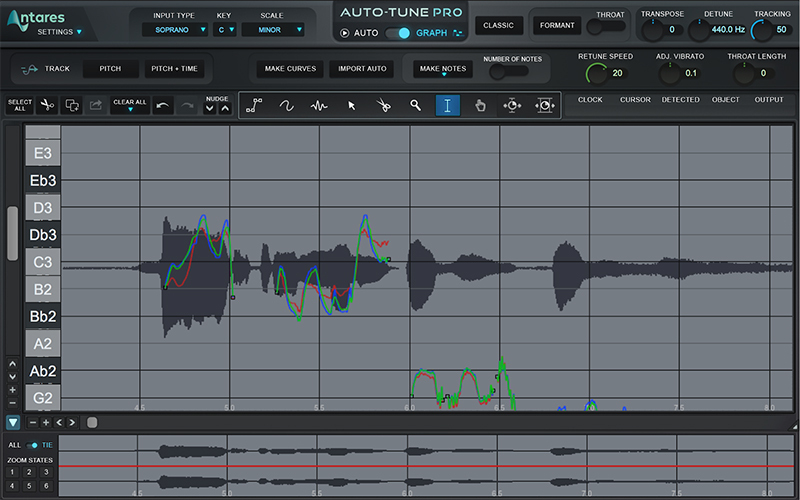 Three years have passed since then, and we’ve got our hands the significantly updated, Auto-Tune Pro. 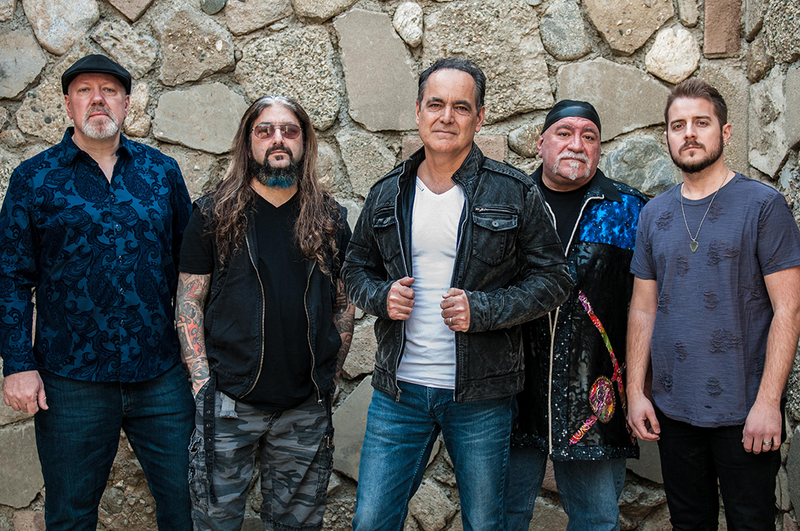 We’re happy to report that the improvements to this release are significant. New users will find a polished user interface in which the automatic pitch correction tools work better than ever, while advanced users will find that manual, graphical-mode editing has been significantly improved as well. If you’ve used previous versions of Auto-Tune (AT), you’ll notice the user interface has been significantly revised and polished. 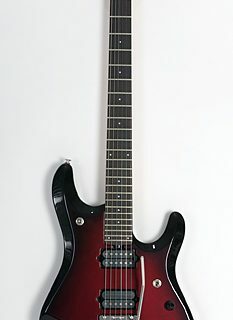 Commonly used functions (Retune Speed, Flex-Tune, Humanize, Vibrato) have larger controls than previous iterations that stand out for easy adjustment. Auto Mode and Graph Mode have both been updated. Auto Mode, which works in real time to correct pitch, now uses two screens: Basic view to address most common features, and Advanced view to address other features, such as MIDI, vibrato, and scale functions. The Advanced view also includes the ability to specify notes to bypass or remove from the correction, and also includes options for controlling real-time MIDI input, allowing your MIDI keyboard or other controller to tell Auto-Tune what pitch to correct a particular note to. The Graph window itself is larger than previous versions, and contains Zoom State buttons, which are zoom presets that can be custom assigned. Assigning a zoom state to one of the buttons is accomplished by holding down the Option key (Alt on Windows) and clicking on one of the buttons. 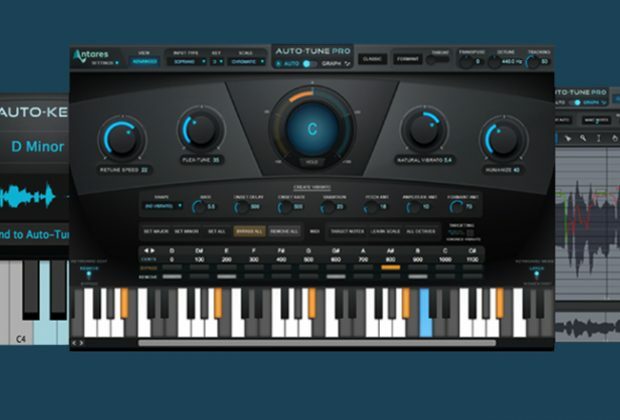 Auto-Tune Pro’s VST3 version (it also includes AAX and AU versions) supports Audio Random Access (ARA) technology. This new feature allows you to skip the audio capturing step otherwise required in Graph Mode, and audio content is automatically populated into Auto-Tune. While this feature is not present in most DAWs yet, this technology is available in PreSonus Studio One, so if you’re a Studio One user, this will be a huge time saver. Auto-Key is also new with Auto-Tune Pro. It is actually a separate plug-in included with the product. As the name implies, this is a key and scale detector that can be used on a track or an external audio file to analyze and determine the key of a vocal performance. It also can send the key and scale info (which you may choose to enter manually) to all instances of Auto-Tune in your session. So, if you’re processing a lot of tracks, it is time saving and can be quite convenient, especially when you’re mixing music that you’re not directly familiar with from the performance/writing perspective. For those producers still in love with the classic “Cher Auto-Tune Sound,” you will be happy to know that Auto-Tune Pro includes a Classic Mode. This uses the sound engine characteristics of Auto-Tune version 5. Each subsequent version of Auto-Tune has its own slightly different character as the goal of the product is to produce as natural pitch correction as possible, but the imperfect sound possibilities popularized in Auto-Tune 5 have developed a strong following. We didn’t have the opportunity to test low latency functionality, but Auto-Tune Pro is usable in the live setting as well. With real-time MIDI input from keyboards or other devices, you can apply pitch correction processing to live vocals, too. And given the improved automatic functionality, this could be a tremendously valuable feature for performers outside of the studio. Years ago, we fell in love with other Antares products such as the Vocal Toolkit and specifically Throat, their larynx modeling plug-in that enabled us to radically (or subtly) transform the actual timbre of a human voice. 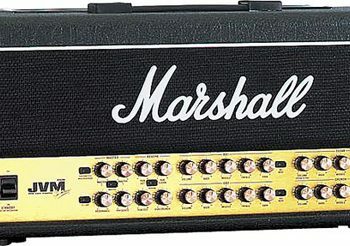 This capability is built into Auto-Tune Pro. Additionally, Auto-Tune includes basic time correction capabilities. 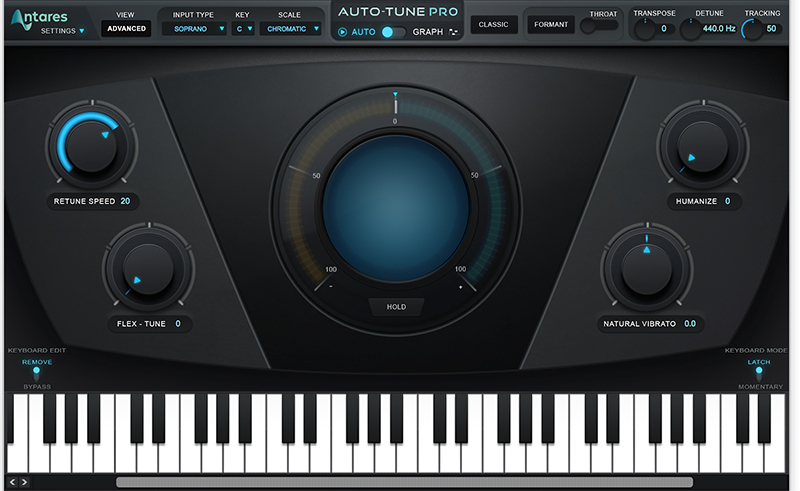 Antares Auto-Tune Pro takes an already powerful-but-easy-to-use product and improves upon the functionality. Newcomers to the software will be up and running easily from auto Mode’s new Basic View, which hides some of the detailed controls that fine tune the nuances of pitch correction. But even the Advanced screen really isn’t confusing or scary. We liked the new layout, and the updates are enough to have us considering whether or not we really need to spend so much time in Graphic Mode. And that brings us to the show stopper, or at least, the user-another-product stopper. We know a number of engineers who switched to other pitch correction products because of the challenges working in Auto-Tune’s graphical editing mode. 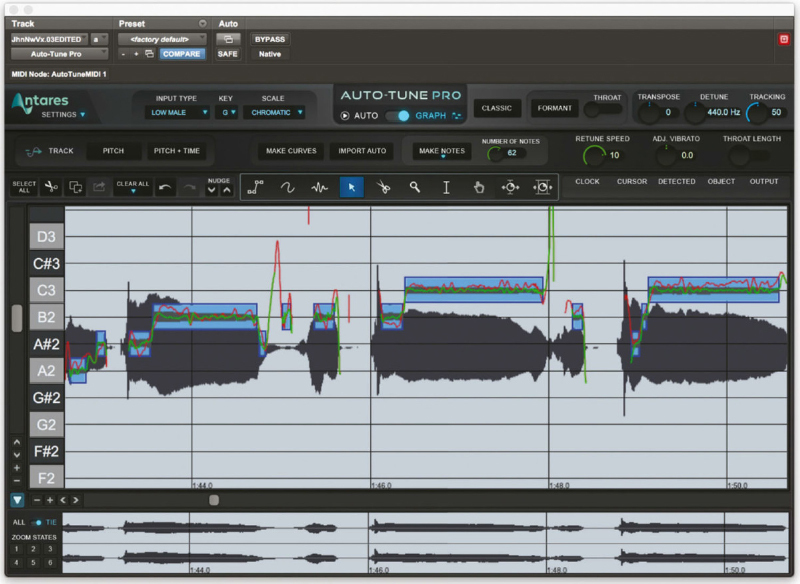 We are so excited about the improvements made in Auto-Tune Pro! Historically, we had various issues with not just the window size, but the fact that sometimes, no matter how we re-sized things, we couldn’t always get a good view of the vocal waveform that we were trying to edit. But the vastly improved editing window provided much greater clarity into our work, and was more easily adjustable in size to take advantage of our large display. When used for its primary purpose—correcting off pitch vocals, Auto-Tune has worked quite well for years, and it just keeps getting better. And by better, the primary difference here is that it’s easier to achieve your desired results using the automatic tools, and editing in the Graphic Mode is simpler. 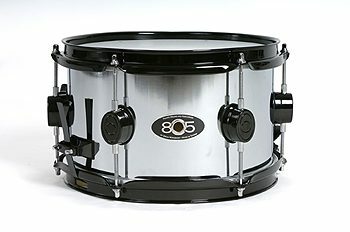 With typical pitch correction, the results here are completely natural sounding. Obviously, the closer to pitch your vocalist is, the more easily Auto-Tune Pro creates completely natural sounding correction. But we have saved some pretty lousy singers from embarrassment, and in the hands of someone with basic mixing skills, Auto-Tune Pro makes it easier than ever before to help the less capable vocalists on your projects sound their best. More extreme pitch correction does sound subtly improved, and producers in need of classic, artificial pitch manipulation will love the purposely more-artificial sound of the Classic mode. The only question is, do you believe in life after Auto-Tune 5? Throat modeling is another great sounding feature. When used judiciously, you can truly tweak the sound of someone’s voice into something more pleasurable. Or, if you want to turn a nice singer into an evil monster, you can do that. And who doesn’t love creating Chipmunks versions of their masterpieces? Or, turn your soprano singer into Barry White! Yes, you can have a good time destroying your work in the most musical manner possible when you start playing with this fantastic capability. Auto-Tune Pro has a well-written manual (PDF) and uses numerous diagrams to illustrate how it works, which is very helpful when learning the ins and outs of Auto-Tune. Antares also provides some useful tutorial videos on their YouTube channel. 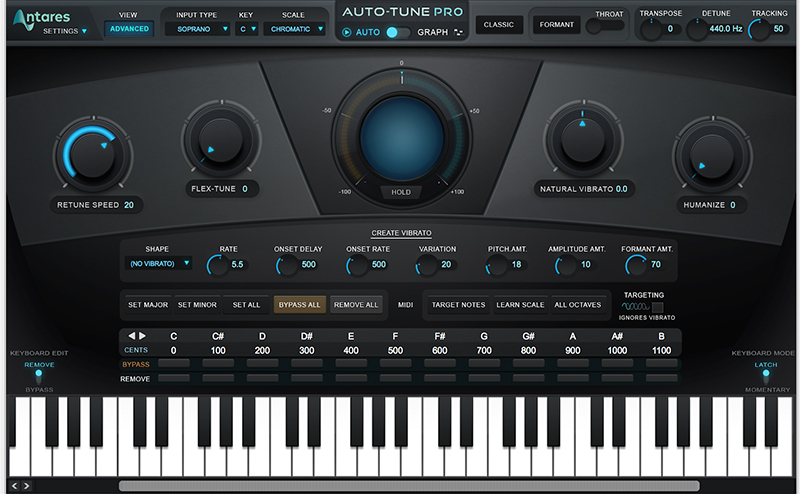 Antares Auto-Tune Pro sells for $399 direct or through retailers. It is a fair price for what is an extremely useful studio (and now, live) tool, but the price will keep it out of the hands of most home-studio producer engineers. If you can live with just the basic pitch correction features without auto-key detection or graphical mode editing, Auto-Tune EFX 3 provides basic capabilities for just $129.